Nouriel Roubini Stock Market 20% Drop Forecast, Time to Buy? According to CNBC, Dr Doom Nouriel Roubini has issued a call that the stock market is expected to fall by as much as a further 20%, not stopping there he also stated that a double dip deeper deflationary recession is likely. Roubini made his call on Thursday with the Dow trading at 10,185. Roubini stated that he expected the stock market to sell off by 20% over the next few months and a double dip deeper recession. He made some recommendations including buying put options, investing in cash and short-term government bonds of countries such as Germany and Canada, he also expects the Euro and commodities to fall over the next few months. As expected the gold fish memory mainstream press has lapped up Nouriel Roubini's comments and run ahead to regurgitate the headlines in promotion of his latest book. So, despite it being a rare sunny day here in the UK, I have taken the time to do some proper research to evaluate Nouriel's market calls over the duration of the bull market which bottomed in March 2009 (15 Mar 2009 - Stealth Bull Market Follows Stocks Bear Market Bottom at Dow 6,470 ). The global equity rebound in March that sent the Standard & Poor’s 500 Index to its best monthly advance in 17 years is a “bear-market rally” and U.S. Treasury yields will “remain relatively low” as investors flock to the safest assets, Roubini said. Treasury Secretary Timothy Geithner’s new plan to remove toxic debt from financial companies won’t be enough for insolvent banks, he said. Though the economists that populate the bankrupt bailed out banks did not do much better. Merrill Lynch & Co.’s chief North American Economist David Rosenberg said today the S&P 500 may bottom out at 600 in October, lowering his estimate after the benchmark’s decline last week. That level is about 20 percent below November’s level of 752.44, which was then widely viewed as the “fundamental low,” Rosenberg said. Mr Roubini, a professor at New York University's business school and former adviser at the US Treasury Department, also said he expected China's economy to grow up to 5.5 per cent this year, missing the government's 8 per cent target. Hopes the world economy will stage a faster recovery this year have fueled a six-week rise in global markets, with major benchmarks on Wall Street and in Asia up more than 20 per cent over just six weeks. But Prof Roubini was doubtful and predicted markets would test the lows seen in March. 21st April 2009 - And again in the Independent. While an increasing number of analysts have in recent weeks urged investors to go back into equities, Mr Roubini, a professor at New York University's Stern School of Business who has emerged as one of the most respected economic voices in the wake of the credit crunch, warned yesterday that he didn't yet see a buying opportunity. He holds little faith in the recent market rallies, which prompted some to suggest a recovery was underway. "I'm still cautious and bearish," he said. "I believe we are closer to a bottom in the stock market than a year ago, but this is a bear market rally." "I am more a realist than a pessimist. I'll be the first one to call for the bottom of this economic contraction, recovery of the market when I see a sustained economic and therefore financial recovery," he said. "Investors are hoping for a V, but there are plenty of signs it could be a U-shaped recovery," he warns, adding that his base case — a 60% probability — is for a sluggish, U-shaped recovery. If his base-case scenario plays out, Roubini says, stocks will be ripe for a price correction of 10% to 20%. The stock market will be “flat,” or almost unchanged, through the end of the year, New York University professor Nouriel Roubini said yesterday in a Bloomberg Television interview. 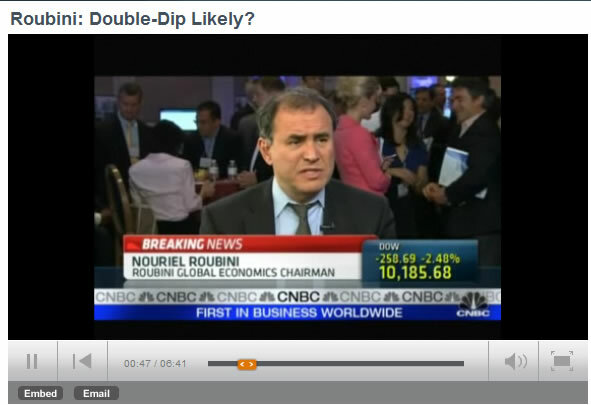 20th May 2010 - Which brings us to the present, with the Dow at 10,185 Roubini calls for a 20% drop on CNBC over the next few months. Readers can draw their own conclusions as to whether stocks are going to be nearer to 20% lower or higher in a few months time. The way I see the stock market, it is not a battle between bulls and bears but a battle between those that will be wrong once and those that will be right once. My last in depth analysis (16 May 2010 - Stocks Bull Market Hits Eurozone Debt Crisis Brick Wall, Forecast Into July 2010) concluded towards the following outlook for the stock market at Dow 10,620. My weekly update will be going out later today, ensure you are subscribed to my ALWAYS FREE Newsletter to get this in your email box. Roubini makes a lot of predicions. Maybe he's now and then wrong on the small stuff, but he's not world famous as a prognosticator because he's inept. If your going to give a catalogue of his errors (after all, it's a complex world and the markets are not free, but rigged), why not be fair and also include talk about his unique triumphs? CNBC invited a guest onto their show to make a stock market call without any analysis of his past stock market calls. Whats the break even point ? Roubini is a Hollywood perma bear. CNBC invites him when they're looking for a bear. That's how he gains his recognition - by being predictable. The analysts that aren't predictable don't get invited very often. It's all about show biz. His personal portfolio was probably long for most of 2009. Yeh, CNBC is a punch and judy show. with what is going on,,, lets say you are about to get your retierment back on aug. 1st,,, and it has dropped from what it was at and the people that is holding your retierment said that it could be put into money market and it would stay at what price it is at now,, but it won't go up or down,, or you can just wait and see if stock goes back up.... so what would you do??? 02 Jul 10, 20:00 retirement ? if your that close to retirement you should have been in mostly cash long ago. Stocks is for the long-term where 10% to 20% moves against you don't matter. Because your investing for the long-run, 5 to 10 years. Under 1 year and you are at the mercy of the market. Under 2 months and your asking for trouble. Your risk / reward profile is too high. The aim of the game is to manage risk. Holding a stock Investment for 5 years is low risk to hold now, less than 2 months is very high risk! The problem is we had to move from alaska back to the lower 48. I'm not 60+ but I had to pull it for the move i know i get a 10% tax on top of the 10%... thats fine but the problem the state of alaska makes you wait 60 days to get your money. they say its for there paper to make sure its all done.. I thought that on my last day whatever my funds where at is what i got back.. but come to find out no they let it go until the 60 days are up... my stocks where doing good but not anymore... and the compeny that its in won't do anything about it they said i can move it around on my own but i dont know much about it... and there is limited stocks i can move it to for some reason,,, was getting 27k now its down to 24 not much of a loss but don't want it to drop down to 5000 by agu.1st any ideas ?